Home Biafra featured BIAFRA: COURT CASE UPDATE; AS JUSTICE BINTA NYAKO ARRIVE ABUJA HIGH COURT; WHAT DOES JUSTICE DEMAND? BIAFRA: COURT CASE UPDATE; AS JUSTICE BINTA NYAKO ARRIVE ABUJA HIGH COURT; WHAT DOES JUSTICE DEMAND? 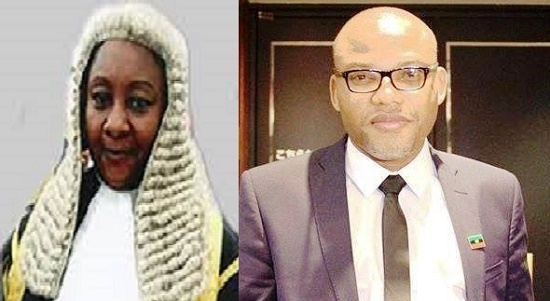 As the arrival of the trial Judge is imminent; let us quickly take a look at what justice demands today; Justice Binta Nyako will decide if masked witnesses will testify against Nnamdi Kanu and other defendants. This is nothing short of secret trial which is very much alien to Commonwealth countries; while there seems to changes- to separate the defendants, justice is everything to them. This is the very point that ended involvement of the last trial Judge; Justice John Tsoho; the now trial Judge has opportunity to fluently oversee the case or derail the case. There is "no how" one will be accused in the open and tried in secret; it is against the law of natural justice. The trial Judge has a lot on her should and this is a chance to prove she is not another puppet. There is no way the leader of Indigenous People of Biafra will agree to the notion of masked or rather secret trial because one secretly tried has been presumed guilty. The act of approving or listening to the plea of the prosecution for masked witness will amount to unfair hearing and this will shatter the case. Tension is right now in Abuja high Court as today will decide if the matter before the Court will go or stall. The entire world and people are curiously waiting for justice and anything less than justice will vehemently be opposed. The Court had denied the leader of Indigenous People of Biafra bail on the last hearing of the Court which was accepted even though there are no grounds for such denial. What will not be accepted today is to try Nnamdi Kanu in secret or masked strangers to testify against him. If the Federal Government accused Nnamdi Kanu of any crime; they should come plain and prove it and there shall be nothing less or more than that. Separating the defendants and trying them in different Court rooms will not have any effect, what is important or effective is justice that is expected today.